This circular walk starts in front of Byland Abbey. Byland Abbey was started in 1177 by the Savigny monks, a reforming branch of the Benedictines. From the abbey, the walk heads into Wass and then follows a track through a wood for about one mile to reach Mount Snever Observatory (a now disused stone tower) before descending to Oldstead and heading back to the Abbey. Parking: Roadside parking is available by driving about 500 yards past the Abbey heading in the Coxwold direction from Wass (grid reference SE 548 789). Facilities / refreshments: None at the start of the walk. Pub in Wass. 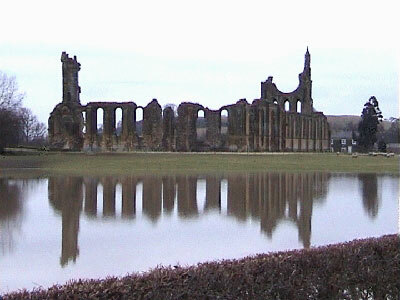 Byland Abbey was founded by the order of Savigny monks, a reforming branch of the Benedictines. The Abbey was started in 1177 around a temporary church, which was demolished bit by bit as the Abbey took shape around it and was finally finished in the 1190s. They moved from an earlier site at Old Byland because they could hear the bells from Rievaulx Abbey and vice versa. By 1538 the abbey was a very prosperous place, but then the abbot John Ledes along with his choir monks were forced to hand over the land to Henry VIII's suppression commissioners, and the pillaging and destruction of the Abbey began. When it was first built, Byland was the largest Cistercian monastery in England being 110 yards long, and the west front was dominated by a rose window, traditional in Cistercian churches. Start in front of the Abbey Inn opposite the entrance of the Abbey itself, and whilst facing the Abbey head left along the road towards the village of Wass about five hundred yards distant. Continue along the road down the side of the Abbey and follow the road around to the left as it enters into Wass. After entering into Wass, as the road bends around to the right at the Wombwell Arms, turn left up the road with a 'No through road' sign. The metalled road climbs slowly and soon passes a green footpath sign that leads back across to the Abbey. Ignore this and carry on up the road, which soon becomes an unmetalled forest track immediately after passing through a gate. Follow this track up hill through Abbey Bank Wood for a few hundred yards until the track forks. Here take the path directly ahead over a stile, which bisects the two tracks following a footpath sign for "Cam Farm and Observatory". The grassy path slowly climbs initially by the side of the woods before leaving it, veering off slightly right and running about fifty yards parallel to the right of them. The path slowly climbs now for just under a third of a mile, before passing over a stile to enter back onto the track in the woods. Ahead are two tracks, take the left hand one following the yellow waymark sign and the footpath sign for "Cam Farm". The track initially descends briefly then climbs and shortly meets another track. Turn right along this track heading up hill all the while. The track now heads up hill steeply for about a further five minutes walking through the woods before flattening and then enters out on to a wide gravelled track. Turn right along the track that narrows to a grassy path about a metre wide after a further thirty yards. Continue ahead heading out of the trees for the wall, which is now visible ahead. Upon reaching the wall, ignore the stile and footpath signs to continue over it, and turn left alongside the inside of the wall keeping within the woods. After about fifty yards, the wall bends around slightly to the right. Approximately thirty yards further on turn left as the path splits along the grassy path which heads back in to the woods directly away from the wall. Follow this path for a few hundred yards until the Mount Snever Observatory is reached. The observatory is a disused stone tower was built in 1837 (as shown on the plaque over the door) and originally contained a large telescope. A few yards short of the tower, turn left to pick up a narrow path, which winds steeply down through the forest. After heavy rain, the mud down this path can be quite treacherous. The path is a little indistinct at the start, but goes down steeply only a few yards from the front left corner of the tower as the tower is approached. After a few hundred yards the path enters out on to a forest track. Turn right and head along the wide gravelled track following the sign that states "Permissive path to Oldstead". After a few hundred yards go left at a T-junction and continue on over a bridge ignoring a track which shortly afterwards goes off to the right, and head on to the metalled road. Follow this up to a T-junction and again turn left. Follow this road and turn left along a lane by the side of a house following the green public footpath sign, which after a further twenty yards passes over a cattle grid. Head down the tree lined lane towards Oldstead Hall, and just before reaching it as the road bends around to the left, take the footpath off to the right which heads steeply up the grass banking following a footpath sign and then a shortly afterwards a yellow waymark sign. Cross over the stile and follow the path around to the left keeping to the edge of the woods down below. Go on for a further one hundred and fifty yards and go over a wooden stile, still keeping to the edge of the trees, and after a further one hundred yards go through a gap formed by the edge of the trees and a hedge coming in from the right. Every so often along this route, there are yellow waymark signs. Continue ahead and pass over another stile and follow the path now enclosed on both sides for a few hundred yards down to the lane below by way of a further stile. Turn left along this road. A few yards further down this lane, Elm Hag Lake can be seen over to the left. Follow this lane now for the remaining three quarters of a mile back to the Abbey. The road comes out in front of the Abbey and affords excellent views of it and the surrounding area as this part of the final leg is walked.